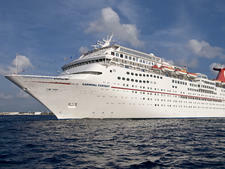 Built in 1991, Carnival Ecstasy is the second oldest ship in the Carnival Cruise Line fleet. Numerous refurbishments over the years have kept the wear-and-tear to a minimum, and although small signs of age are beginning to show, the crew makes up for any physical flaws with superior levels of service. A 2017 makeover brought some much-needed food and beverage additions that passengers have come to love on other Carnival ships, like Guy's Burger Joint, BlueIguana Cantina, Alchemy Bar and the Cherry on Top candy shop. Carnival Ecstasy features an easy-to-love grand atrium with a "big city lights" theme that flows throughout public spaces. The vibrant color scheme invites passengers to enjoy their time onboard participating in every activity imaginable from deck parties and dancing into the night to karaoke, trivia and bingo. The ship also offers some family-friendly amenities that up the ante in terms of fun. Hasbro: The Game Show brings audience members onstage to compete in life-size versions of favorite childhood games, while Carnival WaterWorks provides fun, twisty water slides and splash pad fun for all ages. At night, the adult fun on Ecstasy includes lots of bars and nightlife along with the Punchliner Comedy Shows and Playlist Productions big stage evening shows. For something different, try the Alchemy Bar where "prescription" cocktails offer a spectacle of their own. On the downside, the ship only has a single pool and lounge chairs are in high demand. Getting a prime position around the pool requires getting up early or staying onboard during port calls. While Carnival Ecstasy may be small in size (at least compared to some of today's mega-ships), it is big on service. Crew remember your name with only a single introduction and dinner is a dream without having to ask for your favorite drink, an extra roll or after-dinner coffee past night one. Don't be surprised if someone on the crew recognizes you, even in port, and calls you by name. When school is out for summer vacation, spring break or holidays, you'll see many families with small children and teenagers aboard Ecstasy. College-aged students and first-timers are also popular groups of cruisers as well as folks looking for a bargain -- thanks in part to the less expensive cruise fares on an older vessel. Cruise Critic’s professional photographers and our extraordinary community members have taken 1,225 pictures of Carnival Ecstasy. When you visit our photo galleries, you can be assured that what you see is what you get. Everyday dress on Carnival Ecstasy is casual with shorts, T-shirts, swimsuits and flip-flops being the normal poolside attire. Most passengers wear the same attire into the dining areas during the daytime, adding a cover-up or shirt if they're in just a bathing suit. In the evenings, men mostly wear slacks and collared shirts while women don skirts, dresses and other casual items. While the dress code states no jeans, it is not as strictly enforced as the policy requiring collared shirts. Elegant nights come with a suggested attire of suits or dress pants with a jacket for men and cocktail dresses for women. We saw few passengers so dressed up, finding most on Ecstasy were low-key and skipped the fancier clothing. Carnival recommends tipping $13.99 per person, per day for anyone staying in a standard stateroom and $15.99 for those staying in a suite. Tips are split between housekeeping, dining and alternative services (a mix of personnel in passenger-facing customer service positions). Gratuities may be prepaid prior to sailing or will be added to your daily Sail & Sign account onboard. Beverage purchases incur an automatic 15 percent tip, as does the Chef's Table. Room Service tips are at your discretion, but recommended.